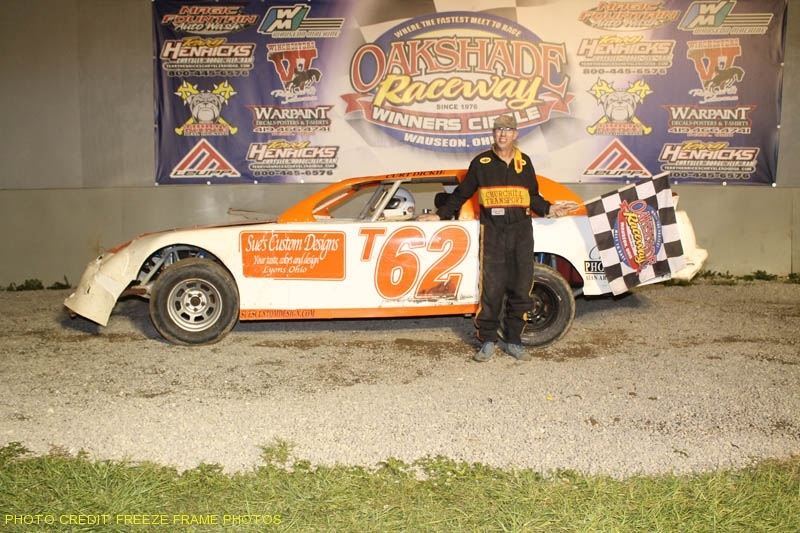 Race fans enjoyed an action packed night at the Butch Wildermuth Memorial American Late Model Series (ALMS) event at Oakshade Raceway on Saturday night that featured Rody Schroyer in victory lane for the first time in just over a year. Emotions were high after a frightening incident earlier in the night in which contact sent Chuck Desgrange’s Late Model out of control at the end of the backstretch and then clipped Oakshade’s pit steward, “Billy Bob,” during the first lap of the third Wynn’s Auto Parts Late Model Heat. Word came back from the hospital during intermission that, thankfully, the worst of his injuries turned out to be a broken ankle. 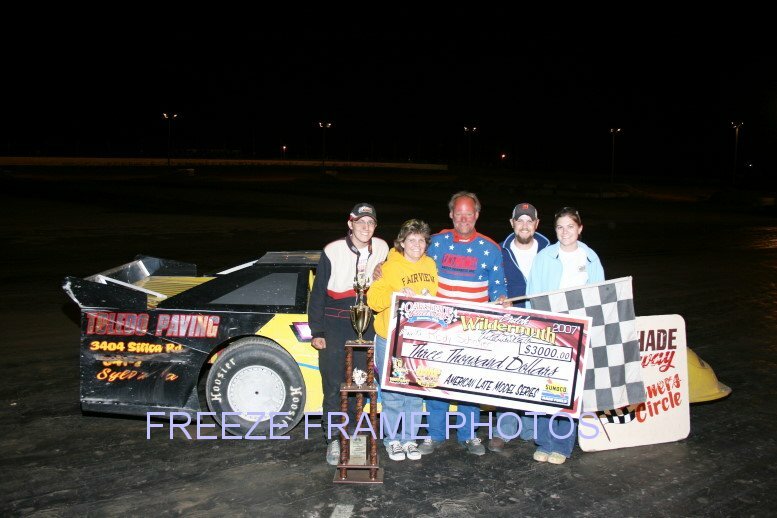 After a collective sigh of relief, it was time for the 30-lap Butch Wildermuth Memorial ALMS Feature event with a check for $3,000 up for grabs. Rody Schroyer from Toledo, Ohio started on the pole and immediately charged to the lead over Duane Chamberlain who had won the previous night’s ALMS event. After a caution for Brad Eitniear’s spin on lap seven, Schroyer began to open up a commanding lead as Chamberlain started to fall back. Last week’s feature winner Ronnie Perrine Jr. and Brian Ruhlman both got by Chamberlain and set their sights on Schroyer. Hillard Miller positioned himself to challenge the leaders after passing Perrine Jr. for third with a little contact between the two drivers in some very tight racing. Ruhlman began to close on Schroyer in the closing laps as Miller was putting the pressure on for second, but Schroyer held on to win earning his first Oakshade UMP Late Model Feature win of the year. Hillard Miller got held up slightly behind a lapped car on the final lap that kept him from challenging Ruhlman for second. Ronnie Perrine Jr. finished fourth with Chamberlain hanging on to finish fifth. The UMP Sportsman Feature had some great racing action with Brian Fisher taking charge early on followed closely by Billy Ruff and Tim Fisher. Ruff went to the lead on lap nine and then tried to fend off Tim Fisher who took over on lap 13. Tim Fisher looked strong but Josh Steinacker closed in and with the help from a lapped car just in front of Tim Fisher, Steinacker took the lead with two laps to go and went on to post his fourth feature win of the year and increased his already impressive points lead in the UMP Sportsman division at Oakshade. Tim Fisher finished second followed by Ruff, Mike Jessen and Even Myers. Chris Henry was attempting to win his second UMP Bomber A Main and took the lead after starting on the pole. Dan Dippman made it three-wide just behind him going through the middle to take over second early in the race. Dippman made a move around Henry for the lead on lap 10 and never looked back as he went on to pick up his second UMP Bomber A Main win of the year. Henry finished second and Brett Miller just beat Jake Rendel for third. Oakshade’s UMP Bomber points leader Tom Ordway finished fifth. Josh Montague was leading the UMP Bomber B Main until he spun all by himself in turn four on the third lap of the race turning the lead over to Jody Burton. Burton then had his hands full as Karl Spores Jr. and Curt Lancaster made it three deep for the lead. Spores eventually came out on top, but Lancaster battled back and took the lead as the white flag flew. Spores got back alongside Lancaster on the final lap, but Lancaster held on to win the B Main. John Roads took third followed by Burton, and Matt Henschen. Toxic Moe grabbed the lead in the Bomber C Main on the first lap with Chris Tressler in tow until Tressler fell off the pace and retired to the pits. Toxic Moe then had to contend with Chris Joy who overtook Moe on lap four and went on to pick up the victory. Toxic Moe held on to finish second with Donovan Paskin, Cliff Bernard and Trevor Reed rounding out the rest of the top five finishers. On tap for Saturday, June 30 at Oakshade Raceway is the Howard Miller Memorial featuring UMP Late Models, UMP Sportsmen and UMP Bombers with gates opening at 4pm and racing at 7pm.